So ladies, the time has come around for you and your soon to be wed to decide on the wedding food, but things can seem more stressful than you expected. 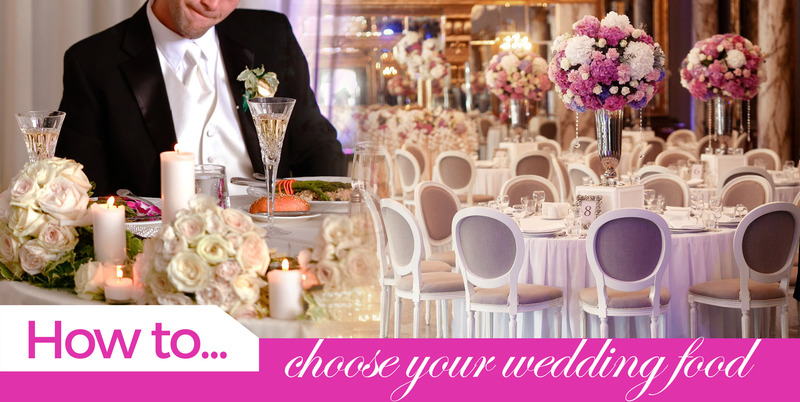 After your venue has been chosen it is of course time for the next big decision to be made, what food to serve all of the guests with. This decision used to be quite straight forward, a sit down dinner, usually some sort of soup, a roast and a choice of desert, nice and simple. But since then things have changed. Now you can have almost anything you could think of, but don’t worry, we are here to help you come to that important decision by going through all the options you should consider. Now the classic is of course a traditional sit down meal, most probably go for this as it is much easier and cheaper to organise, although if you’ve got a fussy family on your hands then it can be quite difficult to narrow down the menu. Or you can keep a few options and get guests to pre-order what they will be having, that way everybody gets served at the same time and you know everybody will be happy with their food. A buffet is usually a long table in a line that is full of a variety of different food offerings. This way everybody can have a nibble of everything and there will be guaranteed at least a few things that everybody will like. As well as there being servers to help dish out and answer any questions the guests may have, due to allergies for example. This is also a great way to save money on catering staff. This modern way of serving food is something that has took the UK by storm. Food Trucks originally started off on the Gold Coast and have been a huge hit everywhere since! And food trucks can serve up almost anything, if you aren’t after giving your guests a proper meal and would rather something more unique then this option would be great! The options of what food trucks you’d want are endless, fancy a waffle? Or perhaps a BBQ truck? Or maybe a hog roast, we’re sure you’d find almost anything to suit your needs. Just make sure that nobody actually expects a 3 course sit down meal. Food Stations are another way of making sure your guests get a decent meal without the waiting on part. Before you get it confused, food stations are very different to a buffet, it is a longer display of food which is often broken up into different parts, for example you could have a table of food from different countries (Italian, American, English, Mexican etc.) or why not mix it up with tables for entrees, salads, sides, deserts. Another more recent trend is a cocktail reception. This would be great if you wanted a big wedding but didn’t have the space to cater for them with dinner tables. The way this works is you would have either waiters or waitresses passing your guests with trays of one-or-two bite portions of hot or cold food, or they could be stationary for guests to go up and get themselves. This offers a more casual vibe for the reception and doesn’t fill the guests up too much either. And if after reading through this you are still now 100% we hope we have helped at least make deciding that little bit easier. And if you have still got some hen do planning to do why not have a browse through the hen party activities that we have on offer.